If you think these are just houses, think again. These were all schools at one time. Before 1950, each school for white children was considered a district. On May 6, 1950, the numerous small districts of Spartanburg County were consolidated into twelve districts by an act of the South Carolina Legislature. This consolidation resulted in Districts Eight and Nine. District Eight was comprised of the following schools: Mt. Oliveview, No. 35; Clifton, No. 38; Cowpens, No. 50; Lenoir, No. 53, Gold Mine, No. 90, and Cannons, No. 99. District Nine schools were: Whitestone, No. 35; Glendale, No. 39; Pacolet Mills, No. 40; and Pacolet, No. 47. There was further consolidation on March 22, 1952, when the legislature merged the twelve districts into seven. Districts Eight and Nine were merged to form what is today Spartanburg District Three. Click on the school name to read the history of each. Schools have changed in many ways over the years. 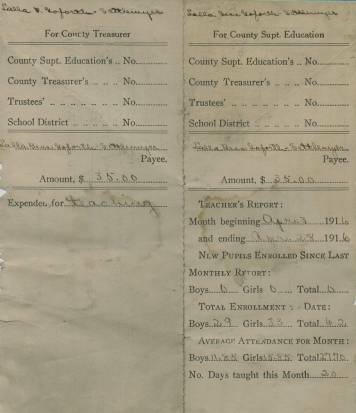 The following copy of a “Teacher’s Report” written in 1916 illustrates how different that school was from ours today. Lalla Bess Goforth Settlemeyer was paid $35.00 for teaching during the period of April 3, 1916, to April 28, 1916, a total of 20 days. Total enrollment was 62 students: 29 boys and 33 girls. On average, however, only about 28 students attended each day. Also, according to local historian David Moore, in the early years of the communities children only attended school until the age of about 10. Then they left school to work and help support their families. Also, he said, in the early years, school was only conducted during the months of October through February, when the children weren’t needed in the fields. Photographs taken by Katie B. with the help of her grandmother.